On Wednesday, March 27, 2019, five (5) CEBIB postgraduates; Gitau John, Osano Maureen, Wekulo Mathew, Kipkiror Nicholas, Okeyo Seline, and CEBIB Technical staff; Rono Edwin, attended a half-day workshop sponsored by Water and Society (WASO) project and hosted at UNES Chiromo Conference Centre. The objective of the workshop was to equip the learners with skills on how to prepare an effective thesis and/or dissertations. The guest facilitator, Prof. Rob Bongaardt from University College of South-Eastern Norway, emphasized that supervision of research work involves defining functional aspects that include the development of institutional structures, rules and regulations as well as planning a research framework. The Center for Biotechnology and Bioinformatics (CEBIB) in collaboration with Chemoquip Limited(Kenya) and HiMedia Laboratories(India) organized a 1-day hands-on workshop on the use of HiPer® DNA Extraction Teaching Kits (Column based) and HiPer® PCR Teaching Kit. The event which was held on February 11, 2019, at CEBIB attracted 30 participants, both faculty staff and postgraduate students. Each of the participants was engaged in the practical use of the kits in the extraction of genomic DNA (gDNA) from a bacterial culture, amplification of the extracted gDNA using gradient PCR, resolution of the extracted DNA/PCR products using agarose gel electrophoresis and visualization of the gDNA fragments in a gel doc. 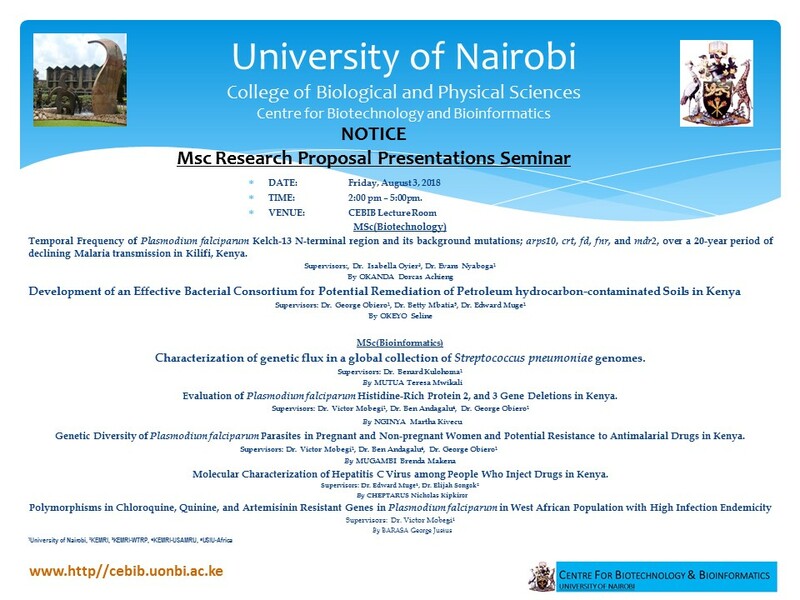 The Centre for Biotechnology and Bioinformatics(CEBIB), University of Nairobi is pleased to invite staff and postgraduate students for the Masters and Doctoral Research Proposal Presentation Seminar to be hosted in CEBIB Lecture room, Chiromo campus on Wednesday, February 13, 2019, at 9.00am. The seminar will involve presentations of proposed research projects (biotechnology and/or bioinformatics) to be conducted by CEBIB postgraduates under the supervision of faculty from the University of Nairobi and other collaborating institutions. CEBIB student, Mr. Accadius Lunayo, is among six (6) promising African entrepreneurs competitively chosen by Swiss Sub-Sahara Business Innovation Initiative (SABII, an initiative of University of Basel) to tour Switzerland's startup ecosystem in June 2019. This will be the second phase of the exchange that will be supported by the Swiss State Secretariat for Education, Research and Innovation. CEBIB Postgraduates, Ms. Zaneta Kidiavai(MSc), Ms. Silviane Miruka(MSc), and Ms. Temitope Jekayinoluwa (PhD) won the top three awards for the best poster presentations at the 1st Annual Conference on Science for Development held on 24th – 25th October, 2018 at the College of Biological and Physical Sciences (CBPS), University of Nairobi. The conference theme was “Supporting Manufacturing, Affordable Housing, Universal Healthcare and Food Security”. The Masters in Bioinformatics students at CEBIB, Ms Kidiavai, and Ms Miruka presented their recently concluded research projects entitled ‘A transcriptional comparison between HIV exposed-uninfected and unexposed infants in Kilifi, Kenya,’ and ‘Molecular identification of Staphylococcus aureus using bacteriophage based genetic markers’ respectively. Photos below: Prof. Bernard O. Aduda, Principal - CBPS, presents gifts to top three poster presenters, all from CEBIB, at the 1st International Conference on Science for Development. In this week’s CEBIB Journal session, CEBIB postgraduates had the opportunity to interact with Ms. Easter Syombua, CEBIB PhD (Biotechnology) student. Ms. Syombua is pursuing her research at the International Institute of Tropical Agriculture (IITA), Kenya. The project aims at establishing a genome editing Toolkit in yams using the clustered regularly interspersed short palindromic repeats (CRISPR/cas) system. Four (4) Centre of Biotechnology and Bioinformatics (CEBIB) graduate students namely, Temitope Arinola, Easter Syombua, Abneel Kaur, and Accadius Lunayo participated in this year’s 7th Annual Biosafety Pre-conferences courses held from the 14th to 15th August 2018 at the Kenya School of Monetary Studies. The Centre for Biotechnology and Bioinformatics(CEBIB), University of Nairobi is pleased to invite staff and postgraduate students to the Masters Research Proposal Presentation Seminar to be hosted in CEBIB Lecture room, Chiromo campus on Friday, August 3, 2018, at 9.00am. The seminar will involve presentations of proposed research projects (biotechnology and/or bioinformatics) to be conducted in 2018/2019 by CEBIB Masters students under the supervision of University of Nairobi faculty and collaborating institutions. The Centre for Biotechnology and Bioinformatics(CEBIB), University of Nairobi is pleased to invite staff and postgraduate students to the 3rd CEBIB Annual Poster Day 2018 to be hosted in CEBIB Bioinformatics lab, Chiromo campus on Friday, August 3, 2018, at 2.00pm. The seminar will involve poster presentations on ongoing research in biotechnology and/or bioinformatics by CEBIB Masters and Doctorate students. Committee, TWAS and IFS Grants). In this project we used recombinant DNA techniques to investigate<?xml:namespace prefix = o ns = "urn:schemas-microsoft-com:office:office" />the significance of plasmids in drug resistance within some local bacterial strain isolates. collaboration with <?xml:namespace prefix = st1 ns = "urn:schemas-microsoft-com:office:smarttags" />Sussex University, Britain).